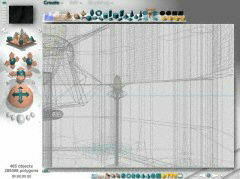 - How does creating a 3D image differ from using a traditional paint program? 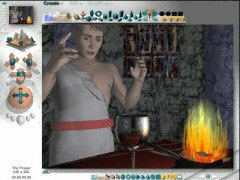 - How is a 3D image created? A traditional paint program creates artwork using tools that would be familiar to most non-digital artists - pens, brushes, color palettes, etc. - plus a whole universe of artistic tools that only exist in our digital world. The medium is different, the method is not. A 3D rendering program, by contrast, is in my opinion closer to photography. Before a 3D image can be created ("rendered" is actually the correct term), I have to build all of the elements of the image. Once my "3D world" is built, I can then go into it with my "camera" and take pictures of it. The creation process I go through will become clearer with my answer to the next question. Rather than present you with a wall of boring text you probably won't understand, let me just show you how it is done. 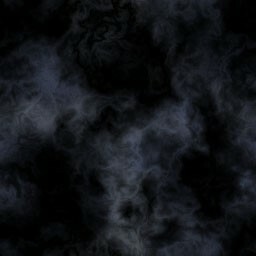 This is how I go about creating an image using a program called Bryce 3D by Metacreations. 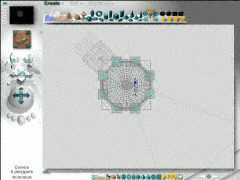 I will take apart the temple I used in my image "The Prayer" to show you firsthand how its done. 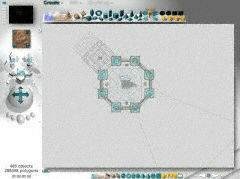 There, now you can see the entrance, torches, altar, priests, columns, wall sections, etc. Some of these "building blocks", such as the walls and columns, are themselves comprised of several pieces. Each wall section for instance, is actually built from nine smaller pieces - to include a stained glass window. Let me go back a a more "normal" viewing angle but point my "camera" at the wall for you. Once the wire model is made, the image is still not ready for "rendering". I still have to consider lighting, color, and texture. 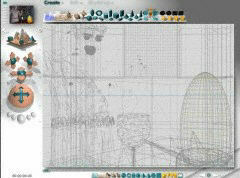 This is the screen from Bryce 3D's materials lab where you create your color and textures for your objects. 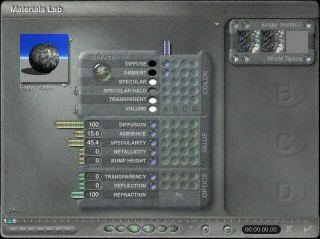 You can save your own custom made materials along with the presets in a library to allow for easy re-use. 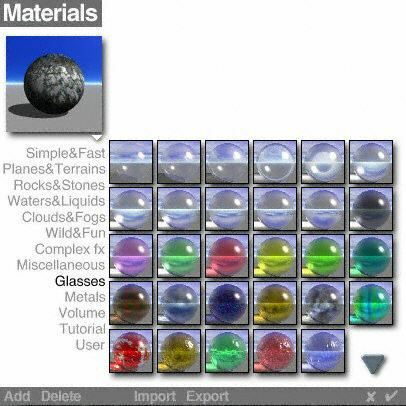 Here are you can see some of the possibilities for glass. The single most important part to a 3D image is the light. If you understand light, you can create stunning 3D artwork. Light can be extremely complicated. When you look at the image "The Prayer" in my Art Gallery you should note the reflection of the temple in the brushed silver chalice, and the ways the multiple torches cast complex shadows upon the priest and altar. Those features in an image only come about by making the light behave the way I want it to, its intentional. 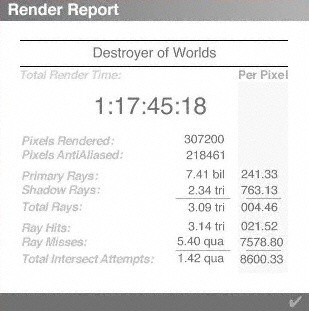 Because Bryce 3D is intended as a landscaping program, it's rendering times are not optimized for non-landscape images. However, if I had to choose between using an entry level package such as Bryce 3D at about $180 and developing a bit of patience, or not doing this at all because I don't have a $10,000+ system, I'll choose the Bryce 3D option. After all, what I hope the viewer remembers is that they went to an Art Gallery, and they (hopefully) liked what they saw. Isn't it the quality of the final image that counts?, not the fact that one artist used a more expensive brush, or paint, or software package than another? Feel free to leave your thoughts in the Guestbook.